This is another photo that needs its own blog post. I wrote last night to my tent buddy from my first Philmont Trek in 1971. We were pen pals for a while in the 70's but we lost contact as adulthood came and other interests took us. My friend stayed true to his gift becoming a writer and publisher of underground comix! I'm still searching for my gift. But my life is good and I love my family. My friend third from right, back row. 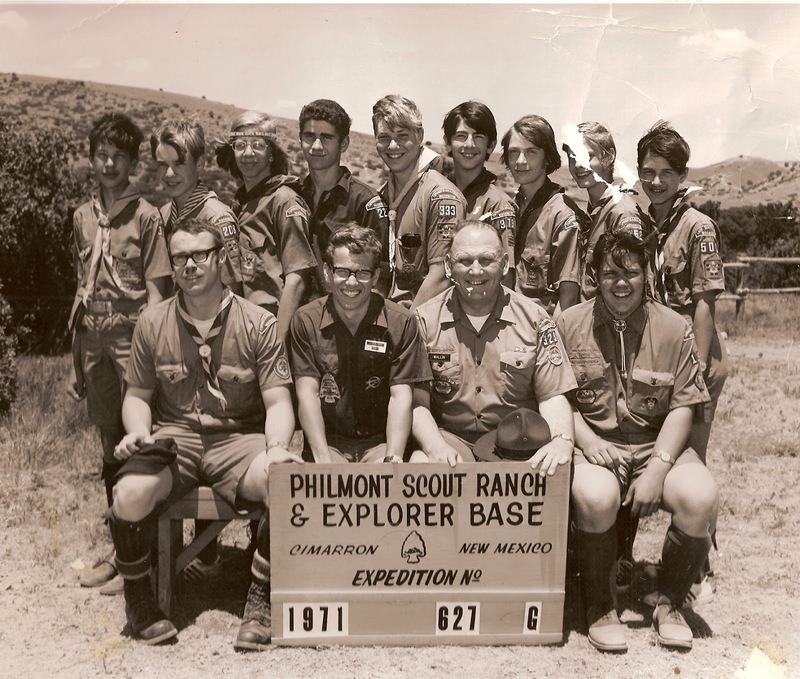 And me - kid on the back far right. PBS Newshour posted a great, "feel-good" video. 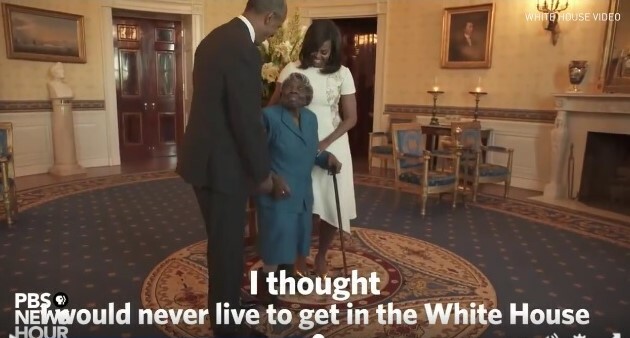 A 106 year-old African-American woman meets the President and first lady in the White House. The first scribbles of an idea came at the beginning of my most recent audit of a Welsh reading class at Brigham Young University. OK, so we're reading "Thomas the Train" in Welsh and I have a ways to go. If only I could spend more time in actual application with the language, I know I could pick it up. My job still takes most of my brain space and there are so many other things that impose on my thinking time. Still, little by little it comes and my Celtic bones take strength from the ancient language of my fore-bearers. This Saxon-English imposed on me is like poison in the blood. Yet I swear the undying language will not cease from the earth as we children of the Black Mountains and Green Valleys strive to keep it alive. Nobody Should Leave the LDS Church. But if Conservatives Need an Excuse . . . .
My Bishop is a really great guy. In one recent visit, I was expressing my exasperation over so many who leave the church because their liberal-leaning souls are hurt. I exclaimed, "Why don't more conservatives who don't follow church teachings leave!" His response that we didn't want anyone to leave calmed me somewhat. And then he went on so tactfully to encourage my responsibility to offer service and Christian love because that's what the Gospel of Christ is really all about. I was sufficiently humbled and chastened. And in spite of my weaknesses, I will carry on. I do find it odd that extreme, right-wing Conservatives can find a more comfortable home staying in the Church than leaving. In my opinion, a lot on the left leave because they feel so uncomfortable around so much conservatism. Frequently, those on the conservative right use LDS scripture and teachings to justify their extremely conservative views. So I just thought I would remind one and all of some fairly progressive and official positions taken by the LDS Church that seem at odds with this extreme conservatism. My sources generally come from Mormon Newsroom at LDS.org where it states,"The official resource for news media, opinion makers, and the public." I guess as a blogger, I could be considered an "opinion maker" even if I don't have that much influence as a voice crying in the wilderness. On Immigration and Refugees, the LDS Church takes a compassionate and welcoming approach in support of the principles of the Utah Compact in support of families and with charity toward refugees. This is a far cry from the current scramble in one major US political party's primary to see who is the meanest and crudest towards immigrants and refugees. But the Utah Compact is not so different from the Immigration Reform proposed by President George W. Bush and Senator John McCain back before their base balked. Clicking on box 44, this is what popped up on the right. Hammurabi (standing), depicted as receiving his royal insignia from Shamash (or possibly Marduk). No, not really. The Founders were men of a Western European Christian tradition. However, their ideas of government and laws were much more expansive than that. As relieved as I was that the occupation of the Malheur Wildlife Refuge ended without further bloodshed, and grateful for the help of all the negotiators who talked (and talked) the remaining armed occupiers into surrendering, I was still a bit concerned by some of the philosophies of the talkers. The occupiers will be tried for their actions that violated law, not for their beliefs. My concern is that certain beliefs need a bit of education so that they don't lead to further dangerous and illegal actions. Yes! Governor Gary Herbert and especially, legislator/lobbyist Ken Ivory take note! 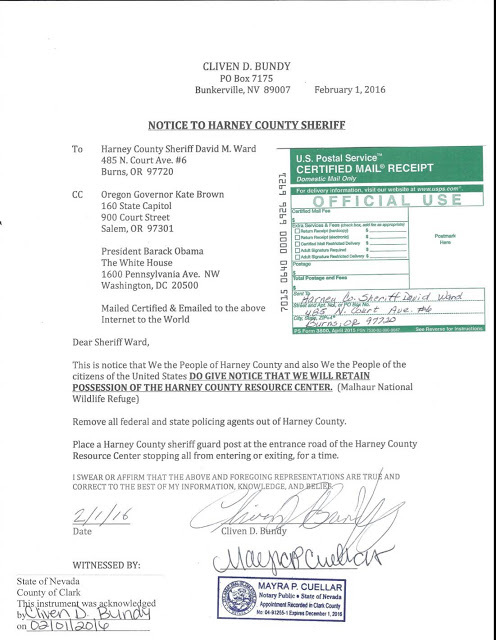 The State of Utah is seriously considering a lawsuit to challenge United States ownership of the federal public lands within the state of Utah based on some tricky readings of the U.S. Constitution, the Utah Enabling Act, and the Utah State Constitution - basically the same theories that the Bundy Bunch have used to claim the feds have no authority in Oregon and Nevada! But wait! Please! A major part of the charges filed today against accused co-conspirator Cliven Bundy in armed confrontation with federal officials performing federal activities on federal public lands is that those lands were obtained by the United States under the 1848 Treaty of Guadalupe Hidalgo with Mexico and never relinquished! Cliven Bundy speaking at a forum hosted by the American Academy for Constitutional Education (AAFCE) at the Burke Basic School in Mesa, Arizona. In a brilliant move by the FBI, agents arrested Cliven Bundy at the Portland Airport last night. I mean, how stupid could ol' Cliven be? 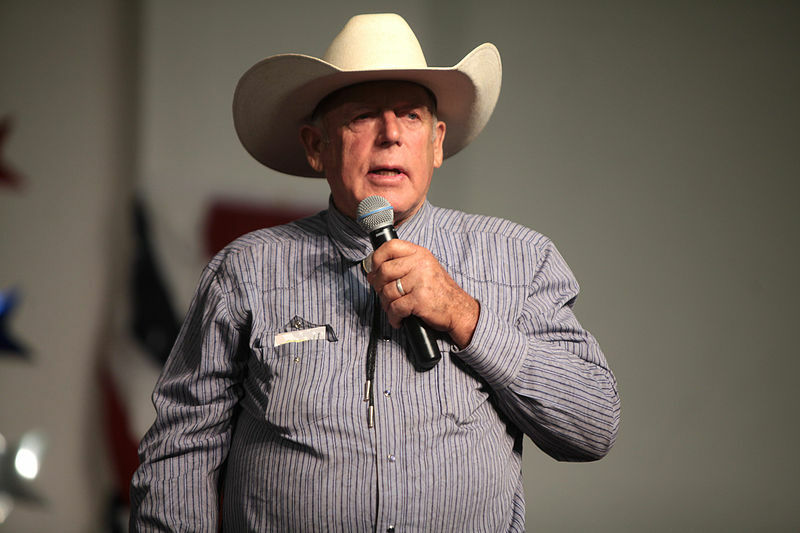 He is the patriarch of the Bundy Ranch Clan and the scofflaw who cowardly called out the unregulated militias to fend off BLM's attempt to legally impound his cattle that he has been trespassing on public lands for 20 years. He now faces charges for that interference with the duties of authorized government officials and I hope there are additional charges related to his active support for the armed occupation of the National Wildlife Refuge in Oregon. (To be technically and biologically precise, they are "feral"
Yeah, so I'm back for another little Civics lesson. 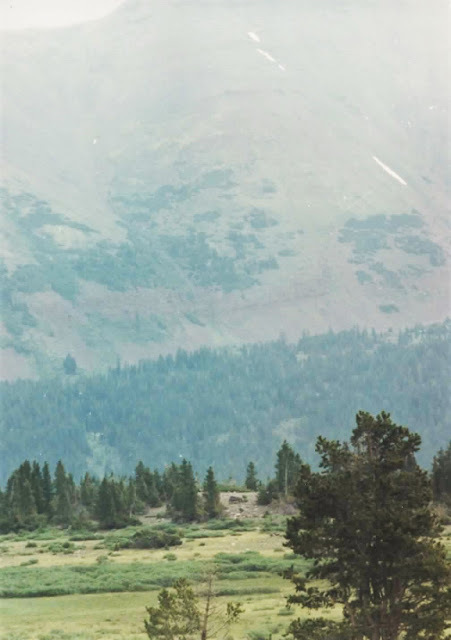 The U.S. Supreme Court ruled 40 years ago that the U.S. Department of Interior can manage the public lands in any state under constitutional federal law. 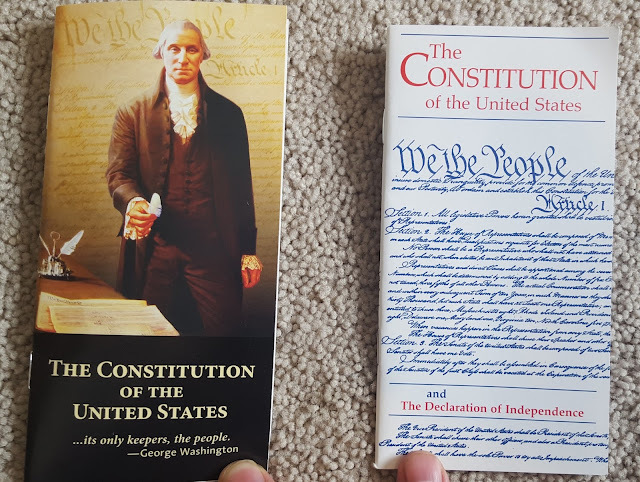 I know, the far right-wing constitutional fundamentalists don't even believe that the Supreme Court can interpret the Constitution. But better them than a bunch of cowboys with guns who forgot a change of underwear . . . and snacks. (I'm pretty sure the US Supreme Court always has clean underwear except for maybe one or two of them. And I think they have snacks in the robing room). 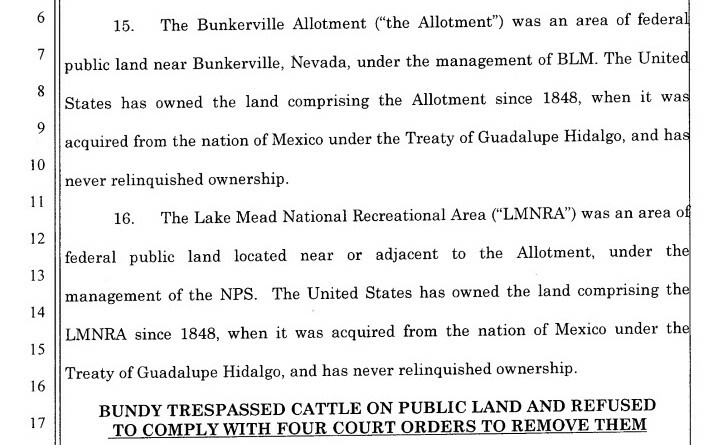 The case is Kleppe v. New Mexico (1976) ruling that the Wild Free-roaming Horse and Burro Act is constitutional. We usually call it "the Wild Horse Act." We don't deal with too many burros in Utah. And it's one of those lovely Acts of Congress that they give us to manage that is absolutely impossible to manage. We are authorized to kill horses, but do you think that's the PC thing to do? And I've even been sued in my own name once as part of an alleged conspiracy to obstruct the act. The US Attorney easily got the individual names switched out for the United States as we were within our official duties; then got the case dismissed. Slam dunk. Yes, I have been a little obsessed with the armed occupation of the Malheur National Wildlife Refuge, the far right-wing views of the Militia with their "sovereign citizen" philosophies, and the tragic death of an old friend caught up in all that. As I've tried to explain, my work includes legal support for the US Fish and Wildlife Service, the Bureau of Land Management, and the Bureau of Indian Affairs. I was also born in neighboring Malheur County Oregon. 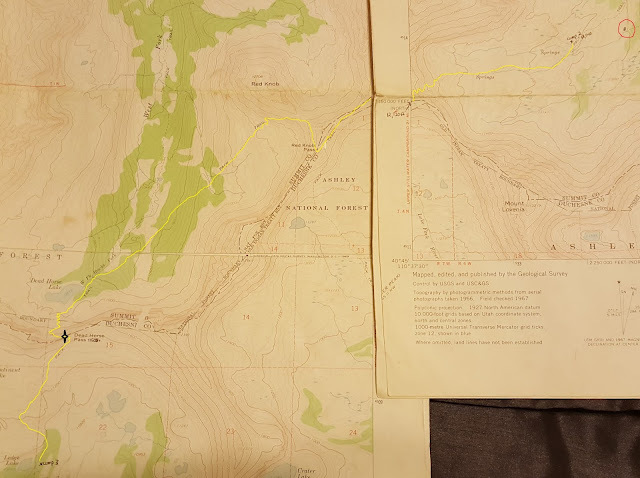 So Malheur Country has been with me all my life. I even have a boy who served a LDS Mission in Oregon with part of his time in Burns. Part of his missionary service was assisting with the roping and castrating of calves. How's that for missionary work!? As we discussed last night, there is a movement among far-right extremists, including the Malheur armed occupiers, to declare themselves independent sovereign citizens outside the jurisdiction of the federal government. [I feel like I should be charging for this lecture series, but I'm no priest-crafter]. It doesn't make much sense to me either, but with a reference to the UCC and other "legalese" language, it looks like an effort to prevent any accidental contractual obligations or subjection to surprise federal authority. While his two sons languish in jail and the Finicum Family moves forward preparing for a tragic funeral, Cliven Bundy continues his vendetta against the People of the United States. Having the form of legality by denying the authority thereof. And he can't spell "Malheur." With money and fear we will justify the assassination of LaVoy Finicum and make political prisoners of all that dare to lift their hand. (We can, we will kill.) This is our livelihood and we will protect our right of life, liberty and the pursuit of happiness, so help me Devil!